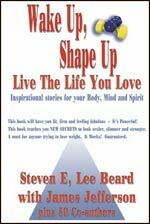 Wake Up Shape Up: Live The Life you Love was modeled after the Chicken Soup for the Soul series of books. It's not so much of a "how to" get in shape book, it's a collection of inspiring vignettes to keep you motivated. We're excited to have been involved in coauthoring this book with some of the top names in the health and fitness industry. Wake Up, Shape Up: Live the Life You Love coauthors include Carla and Lou Ferrigno, Doug Caporrino, the Personal Trainer for “Rocky”, Sylvester Stallone, Eddie Murphy and John Travolta (Doug also does seminars with Arnold Schwarzenegger), Sherry Grander, the QVC Television answer lady and nutritionist for Chuck Norris, Maria Shriver, Evander Holyfield, Olympic Champion Paul Vaden, and many more. The Power of Champions is finally here! 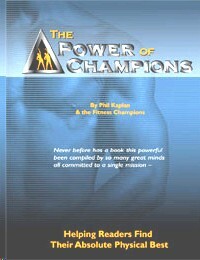 This long awaited book was co-written by 56 of America's very best Personal Trainers. Each author was carefully selected by world famous Personal Trainer Phil Kaplan (Phil has his own radio show, and people fly in from all over the world to pay him $300/ hr for Personal Training). The authors selected the one topic they knew best, and wrote a chapter on it. The list of contributors reads like a who's who of the fitness industry, including ACE Personal Trainer of the Year Stephen Holt of Baltimore, two time MetRx Personal Trainer of the Year Billy Beck of Ft Lauderdale, former Head Trainer of Ediets.com Kelli Calabrese of New Jersey, legendary pioneers of Functional Training, Juan Carlos Santana of Boca Raton and Mark Cibrario of Northbrook, IL, noted researcher Wayne Westcott of Massachusetts, and our own Clint Phillips, who wrote a chapter on how to continually vary your exercise program so that it never becomes boring.